Within the framework of the Book Fair with Switzerland as guest country, the performance evening "Mediakörper" took place in the opening week in the Künstlerhaus Mousonturm with approx. 20 Swiss performance artists. 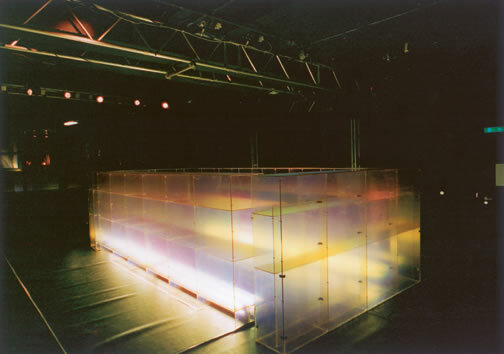 In collaboration with Markus Weiss, Simon Beer realized a bar project located in the stuido stage that was open for the duration of the evening. In this collaboration, two varying positions, respectively, two communicative forms collided to include in the synthesis various platforms for movement. The "Barperformance," staging aspects of the media body and alowing for various communication needs, served as the shunting point for the evening's meetings. By means of highly varied platforms, various sensuous spaces were created in which visitors could find a niche according to their own needs. General view of the construction above the stuido stage lit from within, reachable by three steps. Detail of the construction. On both sides of the bar a specially developed "Ice Wall" cools drinks. Bar construction of Scobalit plastic, flourescent lamps, stage elements, dancefloor, music system, pin spotlights, various drinks, ice cubes, 2 performance artists. Sound: Ambient to Trip-Hop.